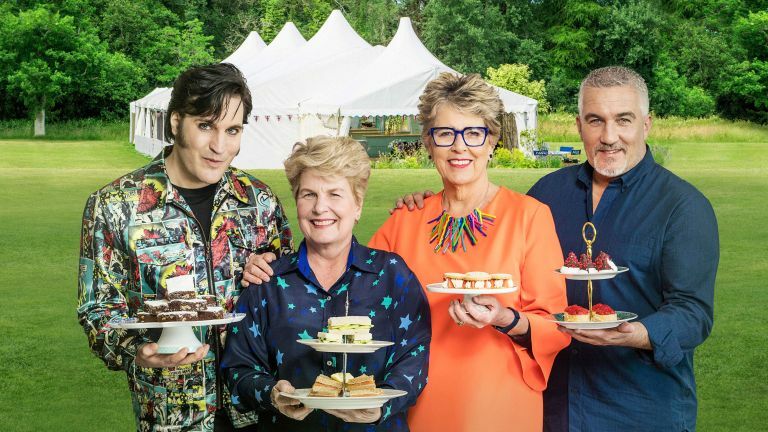 Back and batter than ever, The Great British Bake Off has finally returned to our screens. The nation watches in awe each week to guess who will eventually be crowned 2018's winner (cough *Rahul*)... but why not have a little fun of your own at home? Invite your friends round and let the star baker be revealed. Soggy bottoms not welcome. From kitchen scales to piping bags, here's every small appliance your kitchen needs to recreate your very own Bake Off at home. BTW, we've actually visited the real Bake Off tent (and baked a cake, obvs), so we've got the scoop on the items the contestants actually use. On your marks, get set… BAKE! First things first, an apron is a necessity for ensuring minimal clothes get ruined. And it's not only for those who are messy in the kitchen, as who doesn’t love a personalised item? Print your name, signature slices and level of experience if you really want to sink your teeth in. It’s a well known fact that one of the main pieces of equipment you need before you get your bake on is a pair of kitchen scales. These are the actual ones contestants use in the Bake Off, and for good reason. They're easy to use, even easier to clean thanks to being stainless steel and also have the functionality and reliability needed for your baking and food preparation needs. Did we mention they're extremely reliable? Pretty much a given, there’s nothing a baker needs more than a bowl to mix their ingredients in. Perfectly high walled, this ceramic bowl is just the one for those who tend to spill flour over the edge, and is renowned for lasting and lasting. It comes in two sizes: 4.3ltrs and 5.5ltrs. Decorating your creation is just as important as baking it, and these Lakeland piping bags aren’t only disposable, but unlike other piping bags, they’ve got a lot of grip. You can cut them to fit if needed, and they’re strong enough to hold a lot of icing. As perfect for beginners as they are for experts, just snip the end off and get piping. Beginner, expert or just a hobby baker, you can go a long way with a good set of pans. A lack of space is one thing to put to the back of your mind as this Kitchen Craft seven-piece set easily stacks together into the largest tin, and includes every piece you’ll need. Non-stick is one thing we love, and for a bonus, they’re BPA free. For those who don’t know kitchen conversions (guilty), don’t worry about getting flour all over your phone screen after Googling what you need to know, as this handy print helps you work it out by yourself. Hang it in your kitchen and you’ll become a master in no time. Who says your arms have to be tired of mixing after you’ve made a cake? Introducing the Bakery Boss, your newest best friend. A serious machine for a serious baker with a whopping capacity of 4.7ltrs and a range of attachments, you can’t really go wrong. Making it easy to create anything from thick dough to delicate and fluffy meringues, it also has a timer to allow you to become the ultimate multi-tasker. What better way to show off your marvellous creation than with a glass cake stand? This one from Wayfair does the job and plenty more when it comes to keeping your showstopper fresh, and in terms of ease-of cleaning, it's dishwasher safe. Once the cake has been eaten, you can even turn the lid the other side up and use it as a cocktail glass. You're welcome! Guaranteed to brighten up any baking disaster (tried and tested), this edible glitter comes in a spray can for easy use, and is available in a range of colours from silver to red, blue, black, green and many more. They have this on their workbenches in the Bake Off tent, too.